At Buguruni Anglican Health Centre, Raphael Barua, John Obondo, and Dr. Bahati Maxwell are taking over the leadership from Dr. Simon Walton, our British missionary and health director who is returning to England. Dr. Simon Walton has done a great job strengthening and stabilizing the health and hospital programs in Buguruni. His management, planning, and computer skills have been vital. 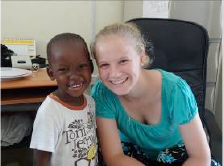 Simon’s daughter Grace (pictured with a young Tanzanian) hopes to follow her father’s footsteps and become a doctor. We wish her well and hope to welcome her back to Tanzania as a doctor in future. While we have been helping to train our excellent Tanzanian leaders, there is still a critical need for an international person to help with the administration and financial management. This will ensure continued transparency at the health centre and the future hospital. He or she does not need to have significant experience and can be just out of school, retired, or anywhere in between. If you know of anyone who might be interested, please ask him or her to contact Henry at hdziegler@yahoo.com.